The NBA has set its 2015-16 salary cap at $70 million and its luxury tax line at $84.74 million. The NBA announced Wednesday that the 2015-16 salary cap will rise to $70 million, the luxury tax line will increase to $84.74 million and the salary cap floor will be $63 million. All three represent record highs for the league, which anticipates even greater growth next season. Those numbers are significantly higher than the the 2014-15 figures. Last season, the salary cap was set at $63.1 million, the luxury tax line was $76.8 million and the salary cap floor was at $56.8 million. This year's numbers also surpassed estimates, which generally projected the salary cap line at between $67 and $69 million. Additionally, the 2015-16 non-taxpayer mid-level exception will be $5.464 million, the taxpayer mid-level exception will be $3.376 million and the mid-level for a team with room under the cap will be $2.814 million. Those figures are up slightly from last season, which saw a $5.3 million non-taxpayer mid-level exception, a $3.3 million taxpayer mid-level exception and a $2.7 million room mid-level exception. 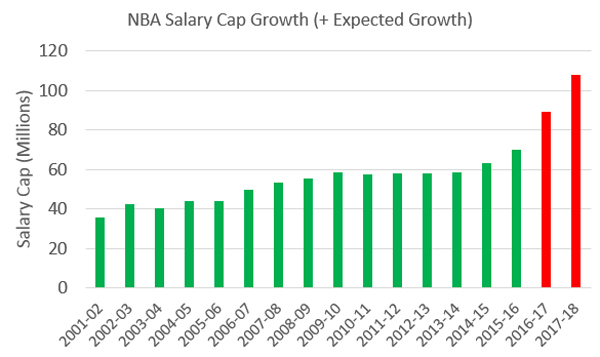 Although the salary cap's $6.9 million jump from last year is the biggest single-season increase since 2002-03, it pales in comparison to the mammoth leap that is expected in each of the next two seasons. Last fall, the NBA announced a nine-year, $24 billion media rights deal that is reportedly expected to take the 2016-17 salary cap to roughly $89 million and the 2017-18 salary cap to $108 million. The chart below shows these anticipated jumps compared to the last 15 years of more gradual growth. The 2015-16 salary cap figures will go into effect at 12:01 a.m. ET Thursday once the NBA's free agency moratorium is officially lifted. Teams have been able to talk to and negotiate contracts with players since July 1 but will not be able to officially consummate those deals until Thursday. During the moratorium, the league's 30 teams agreed to player contracts worth more than $2 billion combined. Both the NBA and the National Basketball Players Association will have the ability to opt out of the current Collective Bargaining Agreement in July 2017.